• PP. 11-22 Who Came to School Today? Poster Tiled on 8.5”W x 11”H paper with yellow squares outlined. Set up for 1-22 students. • PP. 23-34 Who Came to School Today? Poster Tiled on 8.5”W x 11”H paper with no yellow squares outlined. Set up for 1-22 students. • PP. 35 Who Came to School Today? Poster Actual Size (34”W x 22”H) with yellow squares outlined. Setup for 1-22 students. • PP. 36 Who Came to School Today? Poster Actual Size (34”W x 22”H) with no yellow squares outlined. Set up for 1-22 students. 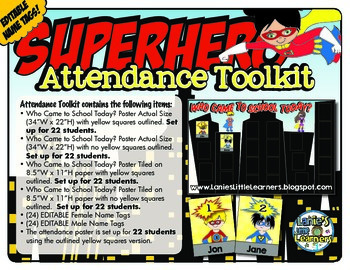 • The attendance poster is set up for 1-22 students. Directions:It is recommended to print all pages on card stock. Who Came to School Today? Tiled poster use the cut marks on the edge of the page as trim marks. There is an 1/8” overlap when assembling the poster pieces. There are 24 male editable tags and 24 female editable tags. Pick and choose depending on your class. 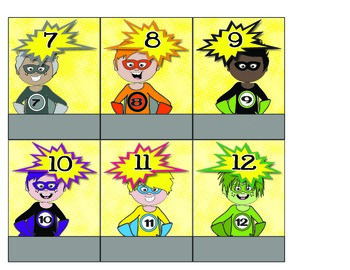 The numbering system is for alpha-numeric labeling system. • PP. 48-59 Who Came to School Today? Poster Tiled on 8.5”W x 11”H paper with yellow squares outlined. Set up for 1-34 students. • PP. 60-71 Who Came to School Today? Poster Tiled on 8.5”W x 11”H paper with no yellow squares outlined. Set up for 1-34 students. • PP. 72 Who Came to School Today? Poster Actual Size (34”W x 22”H) with yellow squares outlined. Setup for 1-34 students. • PP. 73 Who Came to School Today? Poster Actual Size (34”W x 22”H) with no yellow squares outlined. Set up for 1-34 students. 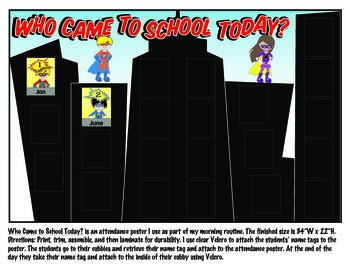 • The attendance poster is set up for 1-34 students. Directions:It is recommended to print all pages on card stock. Who Came to School Today? Tiled poster use the cut marks on the edge of the page as trim marks. There is an 1/8” overlap when assembling the poster pieces. There are 34 male editable tags and 34 female editable tags. Pick and choose depending on your class. The numbering system is for alpha-numeric labeling system. Please go to your My Purchases page (you may need to login). Beside each purchase you'll see a Provide Feedback button. Just click it and you will be taken to a page where you can give a quick rating and leave a short comment for the product. Each time you give feedback, TPT gives you feedback credits that you may use to lower the cost of your future purchases. 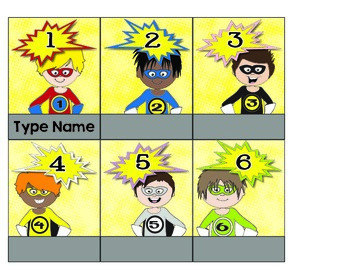 I welcome your feedback as it helps me decide which products are most important for your classroom! Be the first to know when I upload more products: Look for the green star next to my store logo and click it to become a follower. You will now receive email updates about this store. Thanks!